These grilled food days, nothing sounds so enchanting than a skinless and boneless chicken breast stuffed with not only herbs and spices, but the most delicious ingredients known around the world. Imagine how the combo of delicious delicacies enhances the flavors of stuffed chicken breast on the grill rendering nutritious and festive tasting chicken dishes. Sprinkle top of each chicken breasts with salt and pepper, put one slice of cheese, 2 slices of mushroom and 2 tablespoons of the chopped cherries. Roll up closely and secure with a skewer. Brush with the balsamic grilling sauce and grill until cooked from side to side, about 6-8 minutes per side. Drizzle with cherry balsamic sauce and dress up with fresh cherries. Serve alongside fresh greens and rice, if desired. Cream butter over heat. Add the chopped mangoes and parsley then fold. Place it on a butter paper, or cling film. Roll and refrigerate. Heat oil in a saucepan and brown the onions and garlic. Pound chicken breasts to the same thickness and season with salt and pepper. Place a little sautéed onion on top. 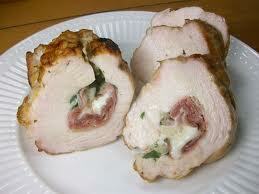 Cut the chilled mango butter into roundels and place them on the chicken. Fold and secure with a toothpick. Grill 15-18 minutes, or until chicken is no longer pink. Mix the mango juice, honey and chicken stock. Season with salt and pepper, and cook until thick and syrupy. Glaze over grilled stuffed chicken and serve hot with raw mango-tossed potatoes and sautéed vegetables. In a cast iron skillet, cook mushrooms and green onions in margarine until tender. Remove from heat. Add the shrimps then stir in crabmeat, cracker crumbs, wine, and parsley, mixing well. Spoon about 1/4 cup of the stuffing mixture onto each of the chicken breasts. Roll up and secure with toothpicks. Place the stuffed chicken in a grill pan and place the pan in the cooking grill. Cook 35-40 minutes, or until chicken is cooked. Baste once with the wine. Serve with rice and your seafood sauce.